"Salads in Greece don't actually have any lettuce in them, and neither does this salad. It also doesn't have any oil. It's very easy to make, and it's perfect for barbeques, potlucks, and picnics." 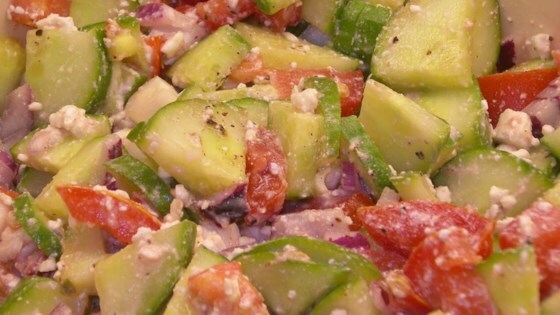 In a large bowl, toss together cucumbers, tomatoes, red onion, feta cheese, and green olives. Sprinkle with red wine vinegar. Refrigerate until serving. Everyone enjoyed this simple yet refreshing salad. I used pitted, black kalamata olives and sprinkled about a teaspoon of dried oregano in before tossing. Will make this often this summer! Took this to a potluck yesterday and it was hardly touched. Tasted blah. Even added fresh ground pepper, and this was still unexciting. This was good. Slicing the cucumbers paper-thin is the authentic and best-tasting way to go! My son says letting it marinate, and adding some dill & it would be a "5"! Nice, easy, quick, and flavorful summer salad. This was good. I made this salad for lunch so I didn't use the amount of ingredients called for, but I did follow the recipe exactly. I think I will make this again for lunch.